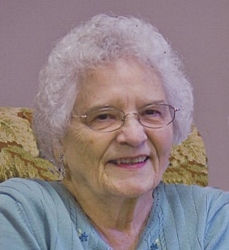 Theresa Jean Posthumus, aged 92, of Grand Rapids, passed away on Saturday, September 8, 2018. She was born to Ellis and Mary Rollins on October 29, 1925, who preceded her in death, as well as her husband of 71 years, Charles Henry Posthumus. Theresa was a dedicated mother and grandmother, always involved in the activities of her family. She loved sports, especially if a grandchild was playing. She also loved good music and passed that on to her children. Much of the music revolved around her steadfast love of the Lord. She worked for a number of years in the Kentwood School System, many of them as a librarian. Theresa will be lovingly remembered by her children, Judy (Stan) Thurber, Diane (Norm) Long, Cindy (Roger) Bingham, and Randy (Lisa) Posthumus; 18 grandchildren; 40 great grandchildren; eight great-great grandchildren; sisters-in-law, Mary Rollins, Peggy (Hayes) Cargill, Fran Blough; brother-in-law, Jerry Posthumus; as well as many special nieces and nephews. Visitation will be held on Friday, September 14, from 10 - 11 am at Christ Lutheran Church, 2350 44th St. SW, where the funeral service will begin at 11 am, Rev. Justin Walker, officiating. Interment in Bowne Center Cemetery. Memorial suggestions include Immanuel Hospice or Christ Lutheran Church.